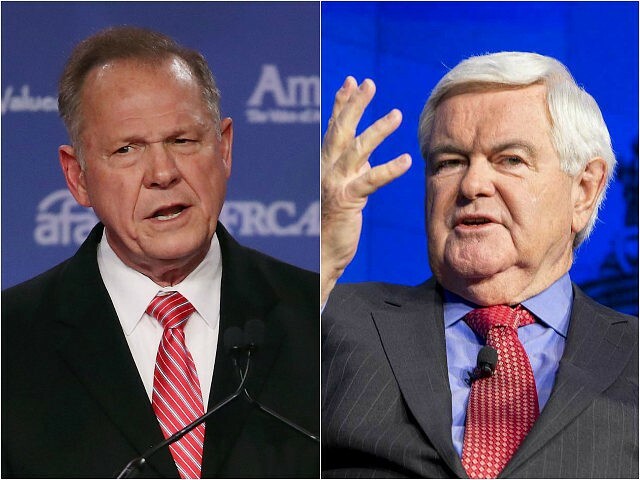 Former House Speaker Newt Gingrich endorsed Judge Roy Moore on Wednesday and asked for others to join in filling the U.S. Senate seat — vacated this year by the now-U.S. Attorney General — with a man who will help advance President Donald Trump’s agenda. “Newt Gingrich is a visionary leader, not only for the conservative cause, but for the entire country. The Contract with America of 1994 was a landmark in American political history and forged the modern Republican Party’s identity as a party committed to tax cuts, welfare reform, and fiscal responsibility,” said Moore. Moore overcame millions upon millions in establishment money stacked against him to win the Republican nomination for U.S. Senate in the Alabama primary runoff election against Senate Majority Leader Mitch McConnell’s hand-picked candidate. Moore did so with the backing of a host of conservative leaders. 2008 vice presidential candidate and former Alaska Gov. Sarah Palin, former White House chief strategist and Breitbart News executive chairman Steve Bannon, Rep. Louie Gohmert, and Duck Dynasty’s Phil Robertson were among those who rallied on the ground for Moore. President Donald Trump has vowed to campaign “like hell” for Moore in the general election.